Includes bibliographical references (leaves 54-55). been both enjoyable and satisfying. particularly want to mention a few. ment at Santa Fe Community College while pursuing my studies. hi t;cgiCgtnnrn nn thi di csertatlon. achieving the terminal objective of their program. traced from Florida State University System data files. changes based on feedback from its environment. a result of its output to the environment"
ment studies of the graduate would be the feedback mechanism. community college in a steady state. feedback mechanisms utilized by community colleges. studies are a part is called follow-up. in achieving the terminal objective of their program. graduates who elect to respond to questionnaires. search and to foster institutional research. fer and employment data from the same population of graduates. data files and the self-reported data from questionnaires. from the selected community college. with data available from existing files. average, and (3) program of study. data from existing data files. definition of terms and procedures. as a segment of the community college follow-up process. cerning the accuracy of self-reported data.
. for dealing with problems or situations"
smallest whole to the total universe. 1. All systems exist in time-space. in steady states" and use of "feedback processes." quire to affect the system. is now known to be important"
be included in the summary of data. in conjunction with other techniques. the characteristics of the non-respondents. in use of biased data. the nine state universities during the Fall Term, 1977.
graduates who responded to the questionnaire. in the State University System files. traced from the system files. ing the State University System from 255 to 289.
average question on the questionnaire and those who did not. average indicated on the questionnaire. extracted from the State University System files. answered the question concerning their grade point average. or 52.0% of the indicated were higher than the extracted. were the same as the extracted. 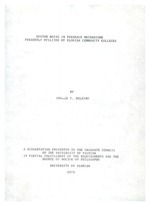 Florida State University System data files. the institution they were attending. in the inaccuracies in reporting. inaccuracy in the questionnaire data. dictated by more graduates than were actually enrolled. perceived enrollments in these areas. certain areas had a lower indicated than actual enrollment. answered the monthly salary question. tion and those who did not. the monthly salary indicated on the questionnaire. the salaries extracted from Department of Commerce files. of questionnaire collected salary data. the graduates were enrolled in the State University System. ratio becomes 255 of 541 or 47.1% of the graduates enrolled. This extrapolates to 467 of the 992 graduates. tionnaire and those who did not respond. of the data if extrapolated to the total population. average extracted from the State University System files. extracted average below a 2.00. 88 had a code designating their area of study. 248 indicated an area of study on the questionnaire. could be expected in each area of study. who responded to the area of study question. ment of Commerce files also apply to extrapolated data. no further attempted comparisons were made. be expected in each salary range. characteristics of the responding and non-responding groups. in characteristics of the two groups. studies being conducted by Florida community colleges. Florida Department of Commerce data files. from the existing data files. data and actual graduate behavior. e from the existing files. uates than were actually enrolled in these areas. by fewer graduates than were actually enrolled. as by the inaccuracies in the questionnaire data. for the company in which the graduate was employed. realistic comparison of the data from these two sources. naires as a means of collecting salary data. of noise into the feedback mechanism. for community colleges has obvious limitations. Good, C. V., & Scates, D. E.
$33(1',; $ 3ODFHPHQW 4XHVWLRQV :KDW LV \RXU SUHVHQW MRE WLWOH" :KDW LV \RXU SUHVHQW VDODU\ SHU PRQWK" ,I \RX DUH HQUROOHG LQ D FROOHJH RU XQLYHUVLW\ SOHDVH SODFH D FKHFNPDUN E\ WKH QDPH RI WKDW FROOHJH RU XQLYHUVLW\ )ORULGD $ i 0 8QLYHUVLW\ )ORULGD $WODQWLF 8QLYHUVLW\ )ORULGD ,QWHUQDWLRQDO 8QLYHUVLW\ )ORULGD 6WDWH 8QLYHUVLW\ )ORULGD 7HFKQRORJLFDO 8QLYHUVLW\ 8QLYHUVLW\ RI )ORULGD 8QLYHUVLW\ RI 1RUWK )ORULGD 8QLYHUVLW\ RI 6RXWK )ORULGD 8QLYHUVLW\ RI :HVW )ORULGD 2WKHU :KDW LV \RXU JUDGHSRLQW DYHUDJH DW WKLV LQVWLWXWLRQ" /HVV WKDQ WR WR WR WR RYHU :KDW LV \RXU SURJUDP RI VWXG\ DW WKLV LQVWLWXWLRQ"